I don’t know how those workers who jackhammer cement, macadam or rock, manage to keep it up. Driving by a construction site where a lone guy stands over a pneumatic beater, legs braced for balance while his overlapping stomach and orange safety vest vibrate to the hammer’s pounding rhythm, forces me to close my truck windows and rush away to avoid the noise and vibration. I say this with the background that as a kid, I worked in a finishing steel mill for two summers and there are very few things as deafening and dirty as a steel mill. So when I told a friend about the need to repeatedly strike the bottom of a silted river with a tungsten jig to summon iced over crappie to my bait, I felt a little guilty calling it “jackhammering.” If you work for a living with a jackhammer, forgive me, but I haven’t come up with a better description of what has to be done to make this tactic work. And the tactic does work. 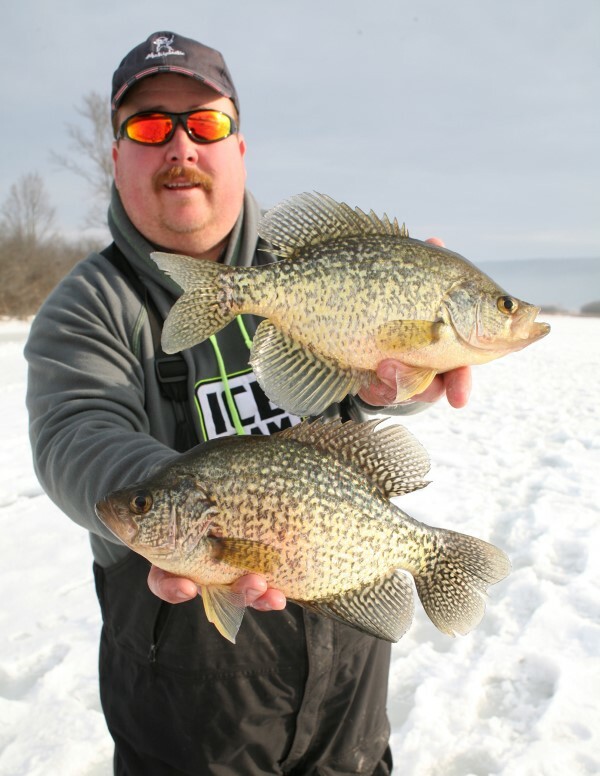 It was on the silted Connecticut River with my friend and guide, Jamie Vladyka, and a Vexilar between my snow-suited legs that I insisted it was necessary to pound the bottom to get the crappie’s attention. An early February morning had dawned bright and beautiful on a sidearm of the dual-state flow but the first fishing of the day was disappointing. 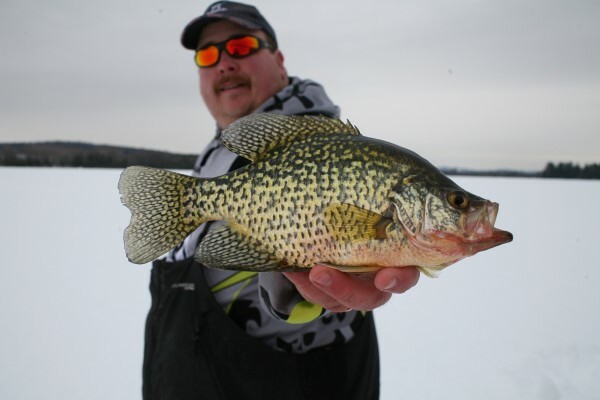 Vladyka had caught a smaller crappie or two next to an island shoreline under 10-12 inches of ice but these weren’t the fish we were hoping for. With Vladyka covering the shallows, I decided to stay more to the middle of the channel. In the 60-yard wide gap between the main land and the island he was only over about four feet of water while my sonar read 6.7 feet. A sonar should have the gain set high. The red band expanded upward when the soft bottom was disturbed to puff the marl and get a fresh reading. The Vexilar’s wide red band indicated a soft bottom while an occasionally “blip” passed suspended in the water column and above my jig, which I lightly danced a foot off the river floor. When one blip — in the form of a colored band — went over my jig I aggressively brought it up to the fish’s level, a big no-no because in the natural scheme of things natural baits do not chase the things that could eat them. Bothered by my own stupidity, I opened the bail on the spinning reel and the jig dropped to the bottom. With the sonar’s gain set fairly high the red band on the Vexilar expanded upward. I had disturbed the soft bottom enough to puff the marl and get a fresh reading. Screw around with the sonar’s gain enough and you might be able to receive North Korean radio — if only the Vexi had a speaker. Of course, crappie aren’t supposed to “feed down” but this one blip rode down the sonar scale and when I bounced the jig off the bottom, again splaying the marl, then raised the bait a foot up, the crappie took it hard. It turned out to be a fine 14-inch fish. Catching the next big crappie wasn’t easy, but it did entail the bottom-bouncing technique. Across the river’s side channel, the crappie were not ganged up. They were in the channel and moving around but not grouped in packs. Though I worked the same hole for another ten minutes, to catch my next good fish I had to find another divot. Still listening to the nearby construction — unmistakable across the empty frozen surface — I dropped another tungsten jig to the bottom. My sonar was not showing anything exciting so I decided to slap the bottom lightly. From about six inches up — as determined by my rod tip — I slapped the bottom several times. On the back of my Clam Snow Drop jig was a pink micro plastic. Most times I like a tungsten jig because its size is appropriate for cold-water crappie yet it carries enough weight to reach the bottom quickly in deeper water. Of course, this water wasn’t deep but the jig profile was still good and the weight proved to perfect for jackhammering. 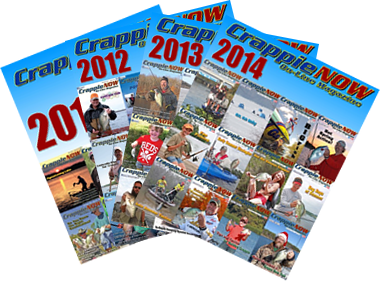 When a crappie comes out of the black do not change what you’re doing. If jigging, continue to jig; if holding it still, remain still. Fish like this one will often take it. Disturbing the bottom in this way seems to send a signal to fish and it might actually release macro invertebrates from the river floor. 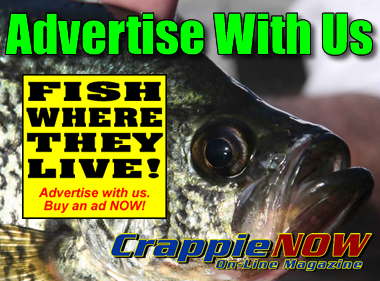 Check you’re take-home crappie for larva such as midge worms. Midge worms are small but often red in color. This coloration makes them easy to identify. I didn’t jackhammer steadily but instead gave the tactic substantial pauses between action. Pretty soon another fat blip, red at the core, green on the sides, approached the jig. 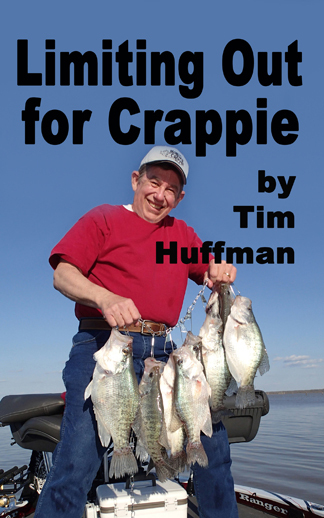 When a crappie comes out of the black do not change what you’re doing. If you’re jigging, continue to jig; if you’re holding the jig steady continue to hold it steady and if you’re occasionally pounding the bottom, take this action as well. The next crappie came to my jackhammering jig and engulfed it. Now I had my second 14-inch black crappie. By this time Vladyka had moved out into deeper water in the channel and I’d told him about sending smoke signals over the bottom. I think he followed my suggestion but in any case he soon had two of his best crappie working a tungsten jig and pink soft plastic. Other anglers had appeared on the sidearm of the river but they didn’t get the quality crappie we bagged. Rhythm is an important factor in the success of this winter technique; however no one rhythm is required. It’s more important that when a crappie approaches — as seen on your sonar screen — you don’t do anything too different. For my regular rhythm I like to bounce the jig a few times from a drop of four to six inches and then hold the jig steady a foot or so above the bottom. Actually, it’s not holding it too steady as I like to flick the jig with an ever-so-light palsy shake while keeping the jig at the same depth. The shake is designed to keep the micro plastic in motion yet not having it appear unnatural. Wiggle a plastic too hard and it looks false. 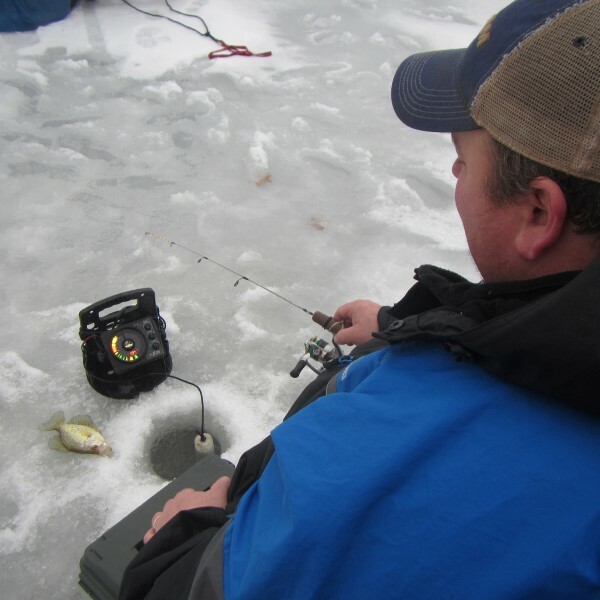 I suggest you practice you’re subtle jigging motion while watching the bait at the top of the ice hole. I’ve taken this jackhammering technique with me into the frozen waters of New York, Vermont, Connecticut and Pennsylvania. In some places the addition of a small larva such as waxworms, mousies and spikes — all are a cream or buff-colored soft-bodied worm — is necessary to make it work. It’s just darn incomprehensible why I can successful fish, time after time on one lake, with just a soft plastic trailer and yet on another lake, not far away, a piece of live bait is necessary. When I truly figure that out, I’ll telegram the world. The fact remains that disturbing the bottom, sending up a puff of marl, either as an attractor or a release of bottom life, is a tactic that works. I call it jackhammering, you call it what you want.